Don't bring your car to Nantucket. Use the shuttle buses, bikes...and your feet. Nantucket Island is 14 miles (22.5 km) long by 3.5 miles (5.6 km) wide (map), and 30 miles off the coast of Cape Cod, Massachusetts. The longest distance you're likely to want to travel is the 7.6 miles (12 km) between Nantucket Town and 'Sconset. Shuttle buses circulate through the island to its hamlets and beaches, bike paths connect the important destinations, taxis serve the airport and ferry docks, so a car really is unnecessary. Surfside & Jetties Beaches: service runs from mid-June through early September, 10 am to 6 pm. Siasconset ('Sconset): service runs via Polpis Road (in addition to the shorter, faster route along Milestone Road) from July through early September, 10 am to 6 pm. Nantucket Airport (ACK): service runs from July through early September from 9 am to 6 pm. Rental cars are available from several companies on the island, or through the national chains by advance reservation. Taxis will be waiting at the ferry docks and the airport when you arrive. Incidentally, almost any taxi driver will be glad to give you a tour of the island, with rates depending on how much ground you want to cover and how much time you want to take. Bikes do well on this small island (except on the cobblestones of Main Street!). The 7-mile (11-km) trip to 'Sconset on the Milestone bike path takes about one hour, half that time if you push it. Remember that bicycle riders are required to obey all traffic signs and signals just like car drivers: stop and yield signs, one-way street signs, etc. In practice, this does not always happen. Some bicyclists will break the rules, car drivers will expect them to break the rules and will therefore defer to them, and the result is a free-for-all. 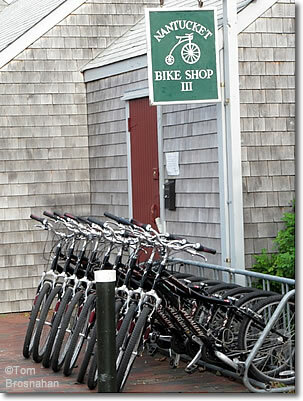 Bicycles are for rent at over a half dozen shops in Nantucket Town, with the most prominent shops being on Broad Street just off Steamboat Wharf. to get around Nantucket Island. 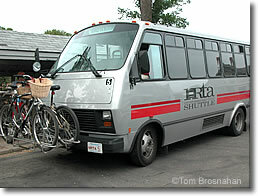 Below, shuttle buses can carry bikes.